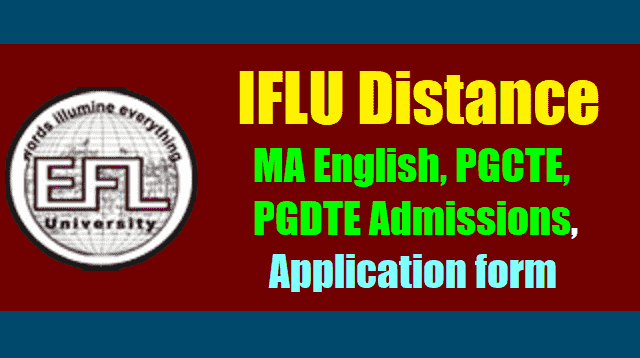 IFLU(SDE) Distance MA English, PGCTE, PGDTE Admissions, Application form 2017. The English and Foreign Languages University(IFLU), School of Distance Education(SDE) Hyderabad has issued post graduate admission notification for this academic year 2017-18. The University SDE invites applications for admission into MA English, PG Certificate in Teaching English, PG Diploma in Teaching English. EFLU MA English distance mode applications 2017 released at efluniversity.ac.in: EFLU MA English distance mode applications 2017: The last date to apply is on October 15, 2017. The course has a duration of two years, and only candidates who have graduated from a recognised university with English as one of the subjects will be eligible for the course. The English and Foreign Languages University (EFLU) Hyderabad has called for applications to the distance learning module for the Master of Arts (MA) degree in English. Candidates who are interested can download the application form from the official website (efluniversity.ac.in). The application forms will only be available until October 15, 2017 and candidates are requested to download the same immediately. Those who wish to apply will be required to fill in the form, attach a demand draft of Rs 500 (Rs 250 for SC/ST) along with a photocopy of your degree certificate or provisional degree certificate and your degree marks list and mail this to “The Dean, School of Distance Education, The English and Foreign Languages University, Hyderabad-500 007”. The last date to apply is on October 31, 2017. The course has a duration of two years, and only candidates who have graduated from a recognised university with English as one of the subjects will be eligible for the course. The university also offers a distance mode postgraduate diploma in the teaching of english (PGDTE). 1. M.A. English- 2 years Programme duration. 2. Post Graduation Certificate in the Teaching of English(PGCET) - One year Programme duration. 2. PGCTE: An M. A. in English or in an allied subject (Linguistics, Education, Mass Communication or Psychology). OR An M.A. (in any discipline) with at least a second class along with 5 years of experience of teaching "Methods of Teaching English" at the M. Ed/B. Ed. Level. 3. PGDTE: PGCTE from EFLU/CIEFL. For application form and prospectus for the above programmes, write to the “Dean, School of Distance Education, The English and Foreign Languages University, Hyderabad 500 007” enclosing a crossed demand draft for Rs. 500/- (Rs. 250/- for SC/ST) drawn in favour of the “Registrar, EFL University, Hyderabad 500 007”. If you are using a printed application form that you have bought from the University you have to pay only the total programme fee for MA Part I or PGCTE or PGDTE. That is, an Indian citizen living in India should send only one crossed demand draft for MA Part I Rs.5100/- (Rs.3150/- for SC/ST) / For PGCTE - Rs.5700/- (Rs.3450/- for SC/ST) / For PGDTE - Rs.6200/- (Rs.3700/- for SC/ST) along with the filled-in printed application form to ‘The Dean, School of Distance Education, The English and Foreign Languages University, Hyderabad–500007’. The demand draft should be drawn in favour of ‘The Registrar, EFL University, Hyderabad 500 007’ You must also enclose a photo copy of your Degree certificate or provisional Degree certificate and a photo copy of your Degree Marks List with your application. – Go to the official website for EFLU as mentioned above. – Download the form, fill in the details, save a copy and submit it before the last date. Application form can be downloaded from official website. For an application form, you can make a request to the ‘The Dean, School of Distance Education, The English and Foreign Languages University, Hyderabad 500 007’ enclosing a crossed D.D. for Rs.500/- (Rs.250/- for SC/ST) drawn in favour of the Registrar, EFL University, Hyderabad 500 007.